On our vacation in Germany, my wife had a salmon fillet with a rösti crust in a restaurant. It was very good, so I tried to cook the dish here at home. It worked at the first attempt! 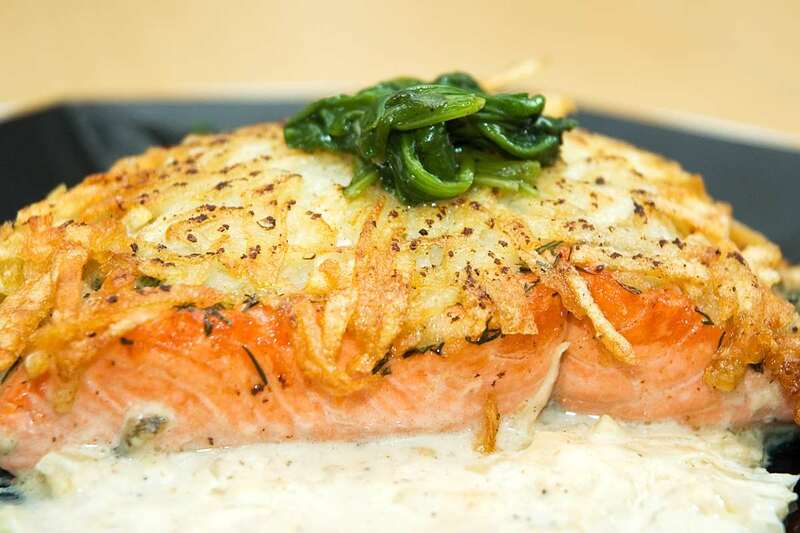 Except for the adventurous idea of turning over salmon fillets covered with raw grated potatoes, the recipe is fairly straightforward and quite easy to cook. A thin layer of dill and a mild horseradish cream sauce are very nice additions to what we ate in Germany. Place salmon fillets on a cutting board, skin down. Distribute chopped dill over the salmon fillets and season with freshly ground pepper. Equally distribute grated potatoes over the salmon fillets. Press on well, so that each fillet is covered with a thin layer of grated potatoes. Set oven-proof non-stick pan over medium-high heat. Add olive oil and butter. Carefully turn over salmon fillets so that the potato layer doesn't fall off. Place fillet on a large spatula and slide into the pan. Do this for all fillets. Cook until the potatoes are golden brown, that should take about 5-7 minutes. Carefully remove salmon fillets from pan. Discard most of the oil. Add onion to the pan, cook until soft and translucent. Add garlic, cook for 1-2 minutes, do not brown. Add white wine to the pan, stir in the horseradish and the sour cream. Adjust seasoning with salt and pepper. Return fish to the pan, skin side down, potato side up. Place in the preheated oven for ca. 5-6 minutes. Top with sautéed spinach (optional), serve immediately with the sauce.